Courtyard Marriott Gaithersburg - 204 Boardwalk Place Gaithersburg, MD 20878. Pre-registration deadline has been extended to Thursday, May 7th. Online registration form will be disconnected at 4:00 PM EDT! Register online at https://my.siam.org/conferences.aspx. Sponsored by the SIAM Activity Group OPSF, NIST Applied and Computational Mathematics Division and Orthogonal Polynomials, Special Functions, and Applications Steering Committee. All sessions and registration will take place at the National Institute of Standards and Technology. 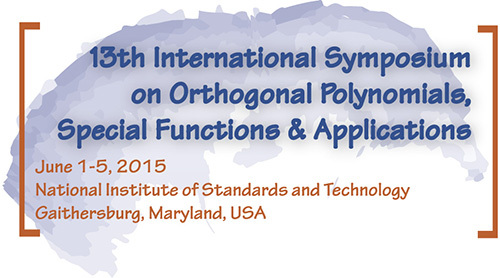 The 13th International Symposium on Orthogonal Polynomials, Special Functions and Applications (OPSFA-13), co-organized by SIAM and the National Institute of Standards and Technology (NIST), is the 13th event in the OPSFA series. Conferences in this series provide a forum for mathematicians, physicists, computational scientists, and application scientists in other fields to communicate recent research results in the areas of orthogonal polynomials and special functions (OPSF). OPSF plays an essential role in analytical and computational investigations in applied mathematics. Information about previous conferences in the OPSFA series is available at http://wis.kuleuven.be/events/OPSFA/. The community which attends OPSFA conferences provides the technical basis for the NIST Digital Library of Mathematical Functions (DLMF), an online source of reference data for use in all areas of science and engineering, and the NIST Handbook of Mathematical Functions (Cambridge University Press, 2010). These resources subsume and greatly expand the well-known NBS Handbook of Mathematical Functions (M. Abramowitz and I. Stegun, eds., 1964). SIAM and the Conference Organizing Committee wish to extend their thanks and appreciation to the U.S. National Science Foundation and National Institute of Standards and Technology for their support of this conference.